Over the weekend, I attended a virtual reality meetup near my home city of Cincinnati. The event had plenty of Oculus Rift units on hand, but it also had a couple other VR headsets priced at more than $10,000. To my surprise, Oculus blew them out of the water. This $350 device wasn't just cheaper; it was significantly more responsive. This disparity was fresh in my mind while reading about a new project to teach medical students about surgery through the Oculus Rift. By strapping on a VR headset, students who want to learn about hip replacement surgery can get a first-person view of the procedure from the surgeon's perspective. If you have an Oculus Rift developer kit, you can experience the surgery for yourself. The project was put together by Rémi Rousseau for the Moveo Foundation, a group that aims to improve surgery through technology. Dr. Thomas Gregory, a surgeon at European Hospital Georges Pompidou and a professor at Paris Descartes University, recorded the video by mounting a pair of synchronized GoPro cameras to his head during the procedure. As far as Oculus demos go, the surgery isn't a particularly advanced use of virtual reality. It's basically just a widescreen video playing in front of your eyes, with the ability to lean in for a closer view of the action. But compared to just watching the video on a computer screen, the Oculus video is arguably better at blocking distractions. Plus, it shows you exactly what the operating surgeon was seeing during real-world procedures. Rousseau notes that students who sit in on actual surgeries are often busy helping out the head surgeon. With the Oculus, those students can focus on the procedure and replay important sections. And it's the kind of thing that only makes sense when the hardware costs are minimal. 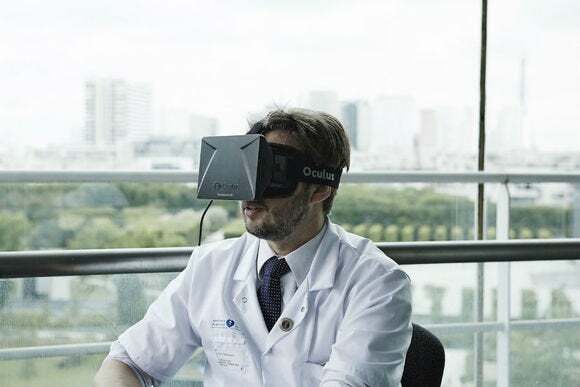 For the same price as one of the more expensive headsets I saw over the weekend, a university could outfit its med school with dozens of Oculus units. It's no wonder lots of other groups are eyeing the Oculus Rift as a tool for non-gaming applications. In a post on Medium, Rousseau expresses doubt that Facebook, which owns Oculus, will be interested in its potential as a medical device given the small market and possible FDA clearance issues. But keep in mind that Oculus sees itself as a software company in the long run. Even if Oculus doesn’t explicitly try to accommodate the medical field, it could build a platform on which these serious uses could grow. In the meantime, those of us without medical degrees can just use Surgeon Simulator instead.